Food brings people together. For hotpot, this holds especially true. It is not just a dish or cooking method, it is a culture on its own. Huddling around the table together, sharing food, trying out new things, and taking the time to enjoy the hotpot and each other’s company is what hotpot is all about. By sharing the must-knows on DIY hot pot, dining out options, and latest hot pot trends, Hotpot Ambassador aims to promote ‘hotpot culture’ and sharing the love for hot pot and everything that comes with it. Hotpot Ambassador is an initiative by hotpot fanatic Manya Koetse (@manyapan), who is a China social trend watcher, and the editor-in-chief of What’s on Weibo, a website providing social, cultural & historical insights into an ever-changing China. Manya’s experiences in China have resulted in an ongoing strong connection with this country, its language, people, and culture. 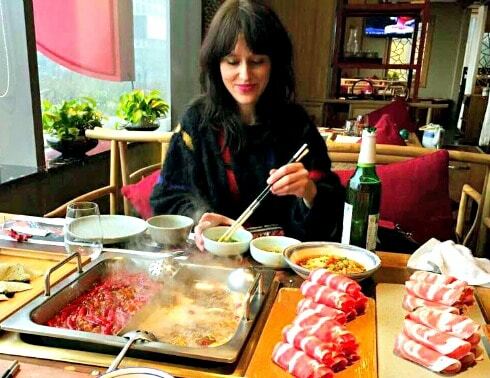 Over the past decade, Manya’s love for hotpot has grown into somewhat of a hotpot mania; she is a frequent visitor of hotpot restaurants around Beijing, but also tries out the latest hotpot products at home. Based in Amsterdam and partly in Beijing, she is a fan of ‘fusion hotpot’ – combining traditional Chinese hotpot flavors with products or tastes from Southeast Asia or Europe. Her dream is to one day open up a hotpot restaurant herself. Hotpot fanatic Manya Koetse is a Sinologist/Japanologist, China media watcher, and the editor-in-chief of www.whatsonweibo.com. She is a blogger and public speaker on social trends in China, with a focus on online media and digital developments, and popular culture. Hotpot Ambassador is an initiative by Manya as a platform to share her decade-long love for hotpot with other people by giving tips and tricks on DIY hotpot, listing the must-know products and go-to restaurants, and providing insights into the (multi-)cultural dimensions of hot pot. For more about Manya’s main website What’s on Weibo see about What’s on Weibo. For more about Manya see manyakoetse.com. For any inquiries, please contact through Twitter or email.